The fi-6130Z color, duplex scanner provides unmatched performance and market-leading document imaging capabilities with enhanced scanning speeds, advanced paper handling and improved feeding technology. The Fujitsu fi-6130Z sheet-fed scanner boosts your organization's document handling productivity without taking up too much space—or breaking the budget. 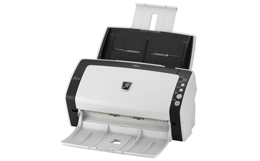 This compact sheet-fed document scanner offers outstanding value for the money. With duplex scanning performance of up to 80 images per minute in monochrome and grayscale, the fi-6130Z scanner handles up to 60 images per minute in color at 300 dpi, offering unparalleled image detail as well as speed. Engineered with one of the most advanced paper separation features in its class, the fi-6130Z is the first workgroup scanner equipped with reversing roller technology*, resulting in unmatched feeding reliability for a wide variety of document weights. The automatic document feeder (ADF) is capable of scanning documents up to 10 feet long, and also robust enough to feed up to three hard cards continuously or an embossed card up to 1.4 mm in thickness. Additionally, the fi-6130Z harmoniously combines the security of Ultrasonic Double Feed Detection with the efficiency of Intelligent MultiFeed Function (iMFF) so that intentional double-feeds, such as a taped receipt or sticky note, can be manually bypassed while double-feed detection is enabled. Adobe® Acrobat® Standard and ScandAll Pro are included with the Fujitsu fi-6130Z scanner, which allow you to quickly and easily integrate your workflow. Physical dimensions 11.8 x 6.4 x 6.2 "